Join a small group of fellow travelers to see the most beautiful sights in San Diego while learning about the natural diversity, American innovations, and pioneering women who help turn a barren landscape in an arid climate into one of the most desirable cities in the world. 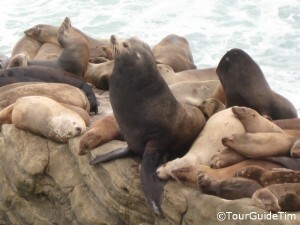 Guided walking tour to see sea lions at La Jolla Cove and seals at the beach known as Children’s Pool. We will visit the places where locals hang out with seals and sea lions playing on the beaches, see the homes of millionaires and billionaires who move here from all over the world, stand atop sandstone cliffs overlooking the vast Pacific Ocean, stop by the world famous Torrey Pines Golf Course, and much more. This bus tour starts in downtown San Diego and takes you beyond the theme parks and museums to see where the locals live, work, and play. We offer much more than your standard tour…we offer an experience you’ll remember for a lifetime, which is why we earn the best reviews in town. 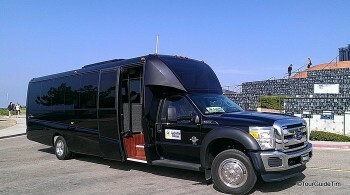 We use comfortable tour buses, including this newer one we use for most tours. In the background is Mount Soledad Veterans Memorial with panoramic views of San Diego. We take advantage of San Diego’s great weather by stopping for guided walks or allowing guests the flexibility to explore on their own. And, because we are the only San Diego Bus Tour to provide a driver and a guide, any guests who have trouble walking can stay with the driver to see the sights from the comfort of a bus while everyone else follows the expert guide for a closer experience. Seals and sea lions playing along the beaches of La Jolla Cove and Children’s Pool. Serene views of jagged ocean cliffs high above the infamous Black’s Beach. Famous Torrey Pines Golf Course, home to the 2008 & 2021 US Opens and annual Farmers Insurance Open, where guests get a discount on souvenirs. Panoramic views that stretch upwards of a 100 miles from the Pacific Ocean to the Peninsular Mountain Ranges where we’ll provide an overview of San Diego. One-of-a-kind Veterans Memorial that includes pictures of Presidents and other famous veterans we will point out on the tour that leaves visitors in awe. 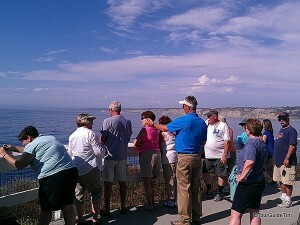 Guests enjoying the Pacific Ocean Views from 300 foot ocean cliffs above Black’s Beach, Torrey Pines. La Jolla Ecological Reserve, Torrey Pines Reserve. Top Gun & MCAS Miramar. The Liberator, Rosie the Riveter, unmanned drones. Famous actors and actresses who grew up in San Diego. Famous business people and professional athletes who’ve moved here. Pioneering women who shaped the community. Athenaeum Music & Arts Library. Medical research including Salk Institute. Tips on what to see and do in San Diego. San Diego Coastal Sightseeing Tour. Or, call to book: 1-858-412-0846. Here are answers to common questions. Additional details and answers are provided when you book through Zerve. Zerve helps tour companies with bookings and basic questions at all hours of the day so our guides can focus on serving our guests. If you run into any problems, don’t hesitate to contact our tour guides directly at 1-858-412-0846 or guide@tourguidetim.com and we will answer or respond as soon as possible. Outside the Santa Fe Train Depot in downtown San Diego. It is the main train station in San Diego serving AMTRAK, regional Coaster, San Diego Trolley and Buses. Map of Parking near the train station. Is public transit available or is my hotel within walking distance? Map of nearby hotels, attractions, and transit services. Hotel pick-up and drop-off is available throughout downtown San Diego. A list of hotels where pick-up can be provided is available when you book through Zerve. What kind of tour bus do you use? We use comfortable, climate-controlled buses with enough room to stretch out and large windows so you can enjoy the views. Do you offer morning tours? We run our Coastal Tours in the afternoon because that is when you have the best chance of enjoying incredible views (instead of the morning fog), watching paragliders fly off the ocean cliffs in a coastal breeze (that generally start in the afternoon), and seeing seals and sea lions playing on the beaches (after their morning dive for food). What is the difference between the 4-hour tours and 5-hour tours? I just wanted to say thank you for the wonderful tour last Friday! I was able to learn so much in such a short time, which was exactly my intention, due to the limited time I was there. You have such a vast knowledge and made it so very interesting and informative. I wanted to also mention that I appreciated your flexibility in allowing my mother to ride and then catch up to group as she was unable to walk the entire time. Should I return or have friends that visit. I would not hesitate to recommend your tour. Thank you, again. G.
My husband and I took the La Jolla/Torrey Pines tour. It was one of the best we have been on. Tim is so knowledgeable and interesting! We thoroughly enjoyed the whole afternoon. My wife and I did this tour a couple years back. Well we had to do it again with our 2 year old daughter, Tim is just so Knowledgable and passionate about his home that you can learn so much from him. It’s well worth the time, It’s well worth the sights and information. Thank you again Tim for a great time, your friends from Winnipeg Cananda. I couldn’t recommend Tim’s tour highly enough. I went on the Coastal San Diego Tour on May 28, 2014, it turned out there were only three of us in total but this did not deter Tim from providing a first class service and adjusted the tour according to our needs. San Diego coastline is beautiful, even the stop at Torrie Pines may have converted me to watching golf next time it’s on. If you’re coming to San Diego and would like that local touch, get in contact with Tim. My husband and I want you to know how much we enjoyed your La Jolla and Torrey Pines Tour. Your knowledge of San Diego, MT. Soledad, La Jolla, and Torrey Pines allowed us to see some fascinating places. You covered all the things that were mentioned on your web site and more. We were honored to meet Bill Sturgeon and by his willingness to pose for pictures with us. You were really in touch with the group of people who were on our tour. I was touched by the consideration you gave to our group. You provided transportation for those who were not able to walk to or choose not to walk. At the same time you allowed those who wanted to walk and get that up close look the opportunity. The beautiful views of the coastline of La Jolla and Torrey Pines were breath taking. We are so happy we took this tour. Thanks for the beautiful lasting memories. We came off of a cruise on which we did 6 shore excursions, none of them were as great as the Coastal Tour in San Diego. We decided to take the Coastal Tour on which Victor was our guide. We had a great time and definitely saw and learned a lot about San Diego in the short time that we were on the tour. 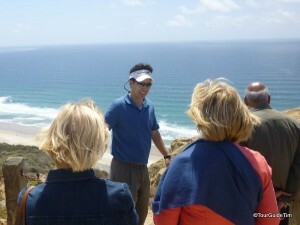 We were very please with Victor and the entire experience and would recommend it to anyone looking to tour San Diego. The best tour ! Tim was very sensitive to everyone’s needs. My husband had a hard time walking so Tim was kind enough to make sure he still see as much as everybody. Excellent tour! Tim is an outstanding guide, and a pleasant surprise – the van/bus is near new. Very comfortable. Tour was 03/19/2014, perfect weather. We have taken other tours before – this rates as one of the tops we have ever had. Tim not only made us feel welcome and important but he had non stop information about the San Diego area. We were very pleased with the whole trip. We would recommend that visitors take this trip. We had a wonderful time. Thanks, Tim and Dennis the driver. The van/bus was practically brand new and rode very smoothly. Thanks, guys. We’ve recently created this new page for our tour. If you’d like to see comments posted by guests on our old page, check out: La Jolla Tour comments. If you have been on the tour and would like to post a review, please do so below. Thank you! Want to read more reviews? Visit TripAdvisor and Yelp.